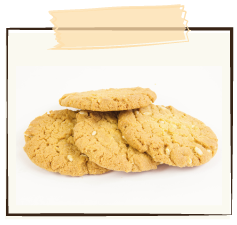 Traditional Anzac biscuit, loaded with golden syrup. Wheat free, gluten free, dairy free, egg free, nut free, soy free and yeast free. 170g pack, containing five biscuits. Sugar, flour (rice, besan, maize), Nuttelex margarine, coconut, golden syrup, puffed rice, baking soda, water added. Use by 60 days from date of manufacture.